Mr. Verlin South Philadelphia High School September 19, 2013. 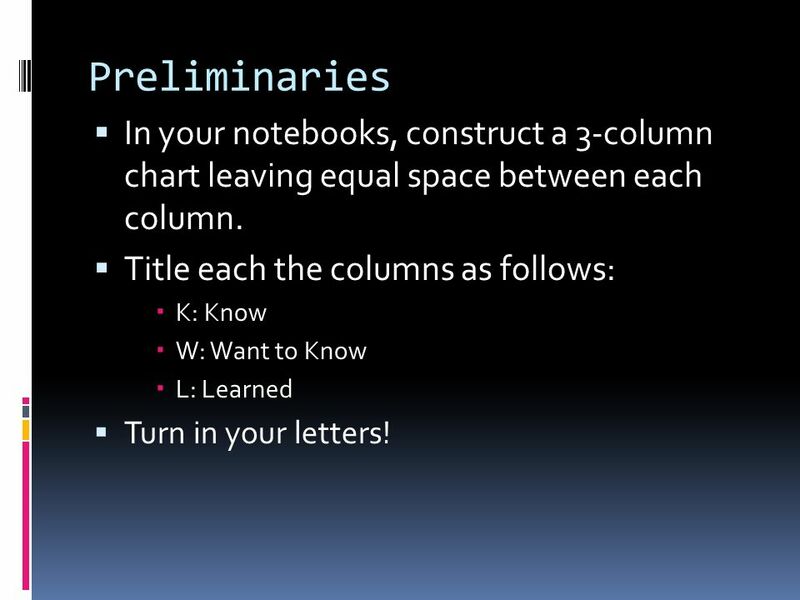 2 Preliminaries In your notebooks, construct a 3-column chart leaving equal space between each column. 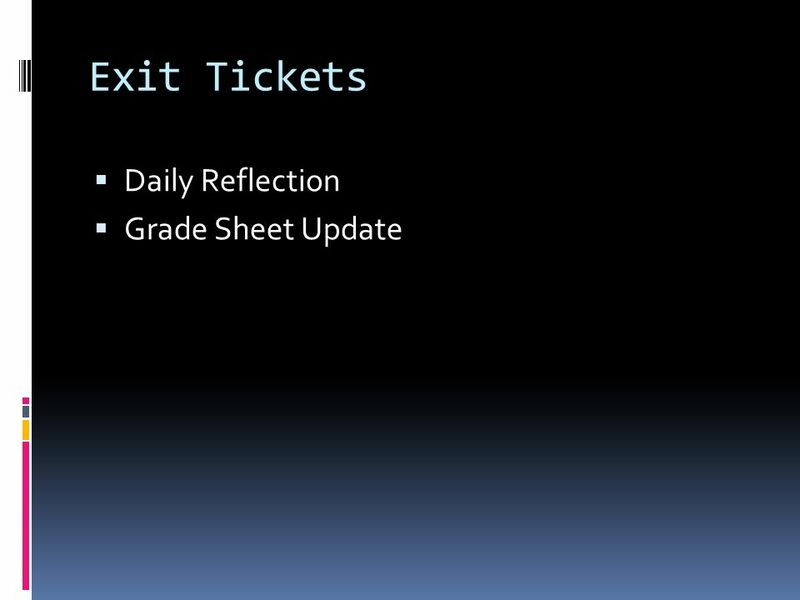 Title each the columns as follows: K: Know W: Want to Know L: Learned Turn in your letters! 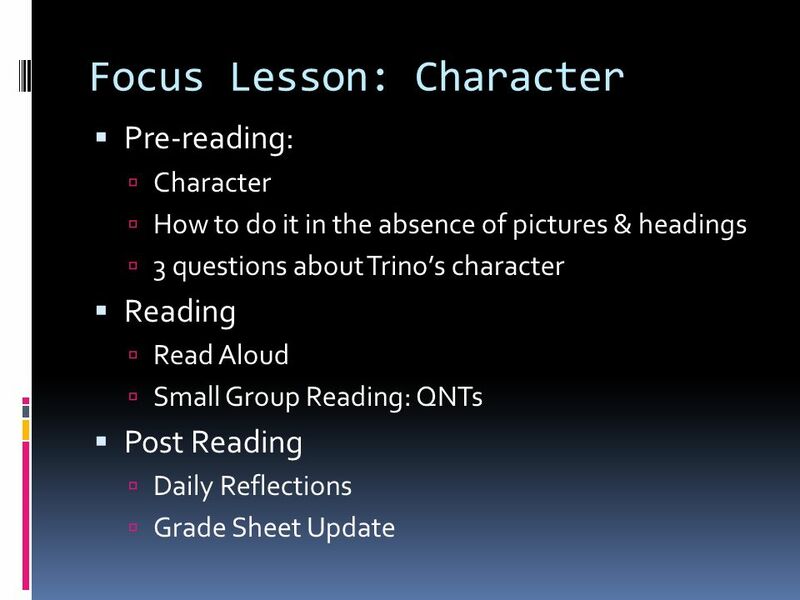 3 Objectives: The students will be able to summarize a reading selection. 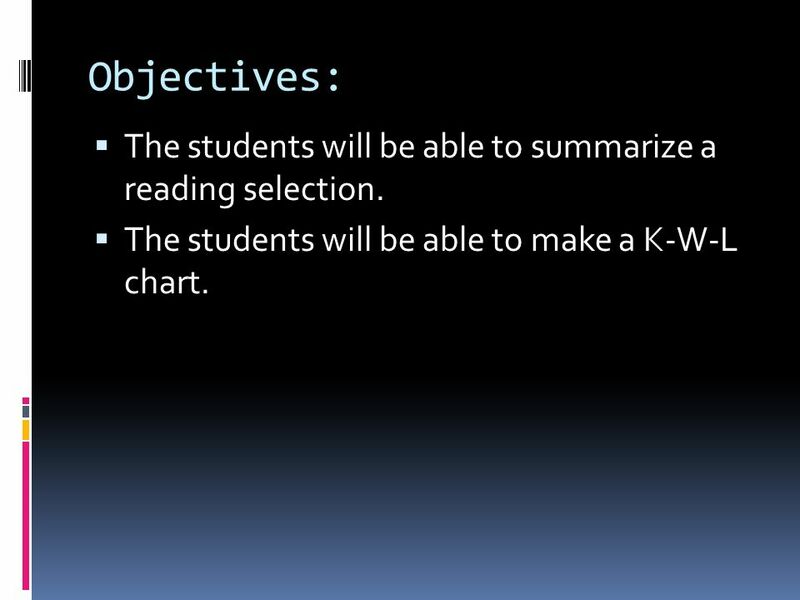 The students will be able to make a K-W-L chart. 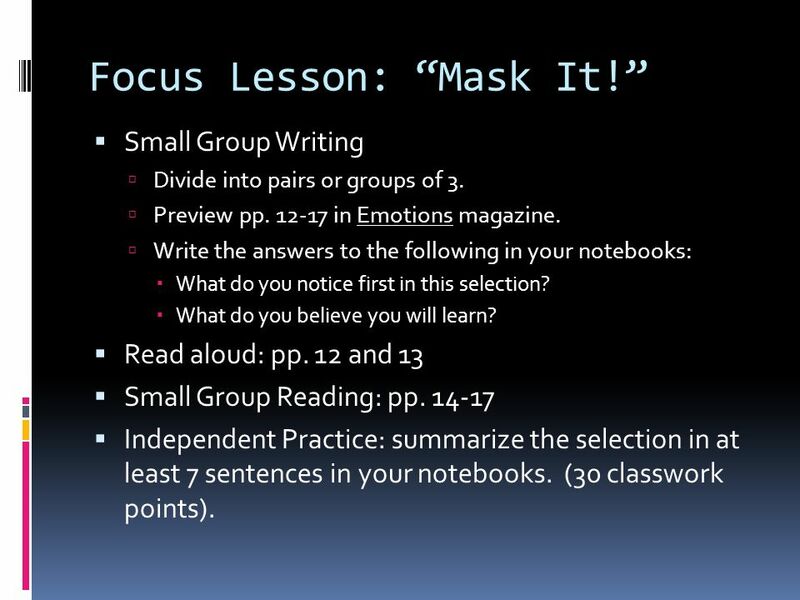 4 Focus Lesson: Mask It! Small Group Writing Divide into pairs or groups of 3. Preview pp. 12-17 in Emotions magazine. Write the answers to the following in your notebooks: What do you notice first in this selection? What do you believe you will learn? Read aloud: pp. 12 and 13 Small Group Reading: pp. 14-17 Independent Practice: summarize the selection in at least 7 sentences in your notebooks. (30 classwork points). 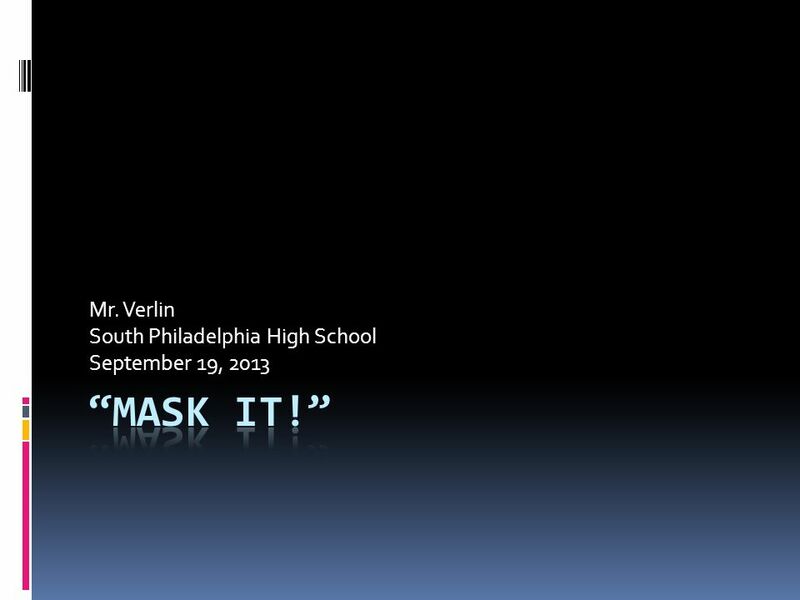 Download ppt "Mr. Verlin South Philadelphia High School September 19, 2013." Mr. Verlin South Philadelphia High School September 12, 2013. Freedom M.S. Data Delve Session II October 6, 2010. Warm-Up 1 of 2 Evaluate. Use fraction answers for decimals. FACILITATORS: KIM BROKER, ANNA KULLINGER, AND CHANH SAYOUTH For Use by DPS and Blueprint Only. Do the Math /Now! Math Fellow Training 2013. Mr. Verlin South Philadelphia High School January 6, 2015. Computer Science Web Site Project Mr. Verlin South Philadelphia High School February 22, 2011. Mr. Verlin South Philadelphia High School October 8, 2014. Mr. Verlin South Philadelphia High School January 8, 2015. Lesson 6.10: Composing a Rectangle Array. Application Problem Sandy’s toy telephone has buttons arranged in 3 columns and 4 rows. Draw a picture of Sandy’s.